Costa Rica has been one of the most popular retirement, and/or second home, destinations for Americans abroad. Some of the most popular areas include the beaches in the Northern, Central and Southern Pacific areas, as well as the temperate climates of the Central Valley. A trip to Costa Rica requires only a two-hour plane ride from the Southern tip of the United States, allowing investors to visit and inspect their second homes regularly, as well as stay in touch with family and friends back home. In addition to the country's natural beauty, Costa Rican property and development costs are remarkably lower than in the United States, and return on investments are higher. Costa Rica's appeal as a second-home destination is even greater today: For the first time since real estate began skyrocketing five or six years ago, prices have softened," says Barry Golson, author of Retirement Without Borders: How to Retire Abroad. "With gorgeous jungle, mountain and beach landscapes, Costa Rica continues to set the tourism pace in Central America." In July 2009, CNN announced: "Forget Disneyland! Costa Rica is the happiest place in the world" With all these factors in play, it is no surprise that the country has boomed as a choice for second homes. And while growth slowed in 2009, preliminary numbers show that growth in 2010 was about 9.2%, returning to 2008 tourism levels. Costa Rica put eco- and adventure tourism on the map. Why should I buy my second home in Costa Rica? 3. Because it's easy to travel to Costa Rica: North Americans & most Europeans do not need a visa, credit cards (& the U.S. dollar) are widely accepted, the water is potable, it is extremely family-friendly and it's close enough that your family will visit you, but far enough away that they won't be there every weekend. There are direct flights to San Jose airport from 10 North American airports, making family visits almost as easy as going to a Florida or California beach destination. 2. Because of the excellent healthcare available in Costa Rica: More than 36, 000 people travel to Costa Rica annually for medical treatments, dental work or plastic surgery. All of the private hospitals are accredited and their fees are extremely reasonable compared to North American fees for the same procedures. 1. Because purchasing real estate in Costa Rica is very easy & safe: You can make your purchase through your retirement account or with local financing. Title insurance is available through North American title companies. Also, regardless of your nationality the Costa Rican government gives you the same rights and protections as the citizens of Costa Rica. There are many other reasons - here are three more! 3. Because Costa Rica is considered the "Switzerland of Central America." Costa Rica is stable, peaceful & democratic. Costa Rica is one of the 22 oldest democracies and abolished its army in 1949, funneling money normally spent on defense into education. Click here for more information about Costa Rica's government. 2. Because you will never run out of things to do. There is an endless list of activities to keep you occupied in Costa Rica. There are plenty of watersports- from surfing to diving to deep sea fishing (and everything in between). Other popular activities in are ecotours, birding, golf, horseback riding, yoga & spa treatment. This is just the tip of the iceberg, click here for more information about activities in Costa Rica. 1. Because of the exceptional quality of life in Costa Rica. You've likely heard somewhere that Costa Rica is ranked the Happiest Place on Earth. The Pura Vida lifestyle translates to a population of happy, laid back, stress-free people. This is way of life is contagious- just spending time in Costa Rica and adapting to their way of life has a positive effect on your well-being. Known for tropical animals and exotic landscapes, Costa Rica beach properties are an ideal setting for a second home and no province is as hot for part-timers as Guanacaste on the northwest Pacific coast. Sá mara is a horseshoe-shaped bay known for its seemingly endless tropical beach of beautiful & pristine white sand. Here you can find some of the best water sports activities in the entire country: excellent & safe swimming, surfing, kayaking, snorkeling, scuba diving, and - beyond the coral reef - fine deep water fishing , all embraced by the arms of the wooded peninsulas that frame the bay. Addi Additional attractions are horseback riding, paragliding, waterfall visits, yoga, private ultra light airplane flights and canopy tours. Directly off Sámara 's beachfront beyond the superb coral reef is a picturesque and deserted wooded island in the bay called Isla Chora. This is a tiny island about a mile offshore, and is a must see for adventurers eager to make the two-hour kayak journey. Those who complete the often strenuous excursion are rewarded with a private pink sand beach, shallow caves, and some of the best snorkeling and scuba diving in Guanacaste. A second horseshoe bay is located a very short drive south at Carrillo. This picture-postcard area is lined with lush palm trees, more beautiful sand, and another calm swimming beach. Here, the local airport is a mere 35 minutes from the capital, San José. And fA And for those things Sámara Beach, or Carrillo cannot provide, the larger center of Nicoya is a half-hour drive away and boasts a modern hospital, supermarkets and the kind of specialized stores that village life cannot offer. "Playa Sámara is the perfect long white sand beach with shallow, gentle waters." And there is even a Sámara art gallery with its own resident artist . El Ancla - Our specialties are seafood, local fish, shrimps, lobster... served right on the beach! * We make no promise as to the quality of food, these are simply examples to show the variety of food available. Dining reviews can be found in traveler's review guides, such as "TripAdvisor ." 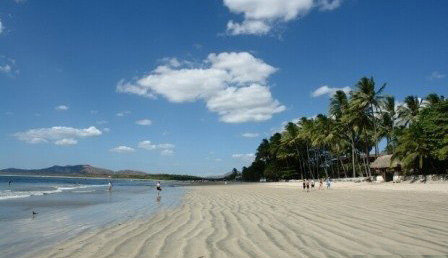 Tamarindo is among the most popular vacation destinations in Costa Rica! If you are looking for a destination that has the perfect mix of touristy things to do and beautiful Costa Rican beaches, then Tamarindo is where you need to be. The area has become pretty developed over the years, but not so much that it is overrun with large hotels and chain restaurants. s.. It is a very accessible town (less than 1 hour from Liberia's international airport), with great sport fishing and golf courses. In the town of Tamarindo you can find many things to do both day and night. There are several bakeries, coffee places, an outdoor vegetable market, art galleries, beauty spas and more than 50 restaurants, bars and discos with cuisines to suit every taste. 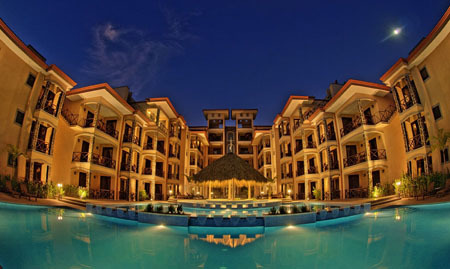 It also hosts an excellent variety of hotels, from economy to luxury. Have you ever considered surfing? This small former fishing village has long been a tourist magnet popular with surfers. Surfing, an exotic and aerobic pastime, is at its prime in Tamarindo. Burn calories while you learn to master the waves! The unique coastline of Tamarindo offers varying wave intensities perfect for the beginner through advanced surfers. Breaks all along Tamarindo are available to choose your own difficulty level from three different beaches. The area is also home to the Tamarindo National Wildlife Refuge, where visitors from around the world come to watch (supervised) leatherback turtles lay eggs. Female Leatherback Turtles, the largest living of all sea turtles, come to Tamarindo each year between November and April to dig their nests and lay their eggs. The female turtle will dig a nest up to one meter deep, lay her eggs and then back fill the nest to prevent predators from uncovering her offspring. Two to three months later, the baby turtles emerge, dashing to the shore and hoping to evade predators. It is absolutely fascinating, and if you have never seen it, you don't know what you are missing. Tamarindo is also well known for its underwater masterpieces. Snorkeling is highly popular and widely recommended. Beneath the water’s surface lies a universe of color and wonder. Besides surfing, swimming, snorkeling, sailing, kayaking, jet skiing, horseback riding and scuba diving, you can visit the nearby wildlife refuge of Diriá, as well as the Marino Las Baulas National Park. And daily tours are available to other fun and interesting destinations such as the Palo Verde National Park and Rincon de la Vieja National Park . 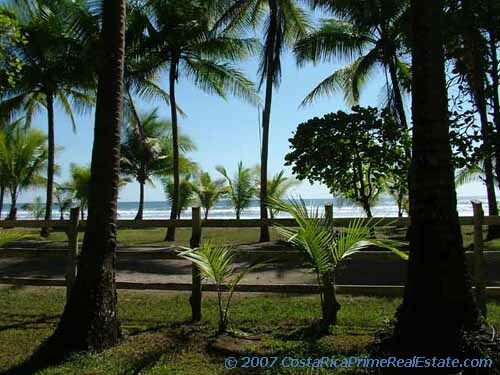 Bahia Encantada phase I (48 units) is an impressive beachfront condo community located at the north end of Jaco Beach Costa Rica. Facing giant panoramas of the Pacific Ocean, Bahia Encantada is the most high-profile beachfront estate in Jaco. The town of Jaco Beach is the closest readily accessible beach to San José (a little over an hour now that the new highway is open), and still has the reputation of being the "fun and sun" spot on the Pacific coast. Playa Jaco is considered the liveliest and most developed beach town on the Pacific coast and some consider it the most popular beach in Costa Rica. Jaco is a small, yet extremely active town geared towards surfers, parties and nightlife, but is quickly becoming the largest seaside community in Central America. Jaco was once an archetypal sleepy beach town. But it wasn’t long before Jaco Beach’s excellent waves began to draw foreign surfers in exponential numbers. 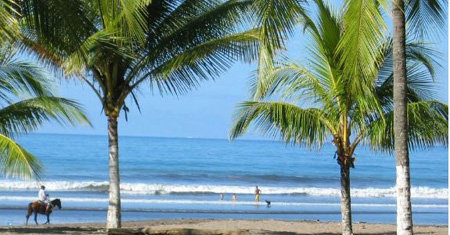 The number one attraction is the surf and surfers love the consistent beach break here and in neighboring Playa Hermosa. Along with the surfers came the need for nightlife. Now, Jaco is Costa Rica’s wildest party beach, and a top destination for tourists. The active village is full of life at all hours of the day and night. There are souvenir shops, local clothing and artisan shops, ice-cream stands, close to 100 restaurants (including some excellent international restaurants have been recently added) and bars, four casinos and several discotheques where you can dance the night away. For families, there is even a miniature-golf course, petting zoo and newly developed playground. During the day, you can take advantage of an abundance of Jaco Tours that will include some of the best sport fishing in the world. There are also ATV tours, canopy tours, an aerial tram, butterfly farms, bird watching, jet ski tours, parasailing, ultra light, horse back riding, kayaking, a sunset cruise, and many other.Other local activities include fishing, canopy tours, kayaking and horseback riding. The Jaco night life scene is very diverse. This is the ideal destination for surfers or young travelers looking to be in the middle of the action. There is an abundance of bars that host live music including Latin music, rock and roll, blues and Jazz. Hard Rock Casino has just recently opened in the Jaco Fiesta Hotel and there are also casinos in the Hotel Cocal and the Hotel Amapola while larger casinos are currently in the planning stages. In a country famous for strikingly beautiful beaches, Jaco is rather lackluster. To make matters worse, Jaco ’s waters are generally unsafe for swimmers—the waves are large, and dangerous riptides are frequent. You need to be careful about swimming here, as riptides are quite common along the beach shore. But Jaco ’s all about the breaks, not the beach. Besides Jaco Beach itself, more of Costa Rica’s best surfing beaches are nearby, like Playa Hermosa, just a few minutes away, where a yearly international surf contest is held that attracts a huge number of surfers from all over the globe . Esterillos Beaches, just down the coast is connected to Jaco and Hermosa by cliffs and small reefs. All three beaches are long black sand beaches with good waves. Again, not ideal for swimming and all have strong tide currents. Playa Hermosa: The setting of the Billabong 2009 ISA World Surfing Games, Playa Hermosa is no stranger to the surf scene. Experienced surfers will love the pounding surf at any of the 7 surf points along the six mile shoreline. For the novice, we recommend grabbing a table at one of the beachfront restaurants to watch the pros do their thing! Playa Palo Seco: Less known Palo Seco a little further south is located between the Pacific ocean and the Palo Seco Estuary. A quiet expanse of beach, where from August through November you can see baby turtles hatching! Playa Herradura: Herradura, just north of Jaco, means “horseshoe” in Spanish and that is exactly what this beach is- a horseshoe- shaped beach with grey sand. Because of the protection this shape naturally brings, this has some of the calmer waters in the area; a good spot for snorkeling and diving. Playas Manuel Antonio: There are 3 small beaches inside Manuel Antonio National Park and another large one outside of the park, all of which are white sand beaches. The waters here are pretty calm so it’s a nice place to go swimming with the family or to sit on the beach watching the different vendors go by with their wares. fringed coast and black sand.